Last night on Dan Carter’s BBC Radio One Rock Show the second batch of bands for next years’ Download Festival were announced and there’s some huge bands in there! First off the blocks (and predicted by many including some of the Rock Sins staff) none other than Chino Moreno and Deftones, who in an awful lot of people’s eyes will provide the perfect warm up for the legendary Black Sabbath! 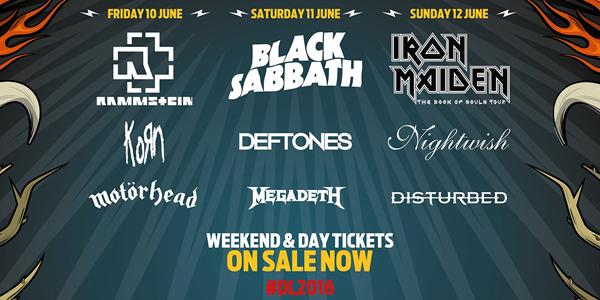 Also joining the fun on the Saturday of Download 2016 are Megadeth! With Dave Mustaine and co returning to Download for the first time in four years (and perhaps with Chris Adler behind the drumkit if schedules allow), Download middle Saturday is already looking mightily impressive. Joining Rammstein on the Friday night to provide what will be a huge crowd pleasing warm-up as sub headliners are nu metal originators KoRn so we can all expect an hour of massive hits. Prior to KoRn British heavy metal legends Motorhead will be returning to Download so fingers crossed that Lemmy’s health holds up. Lastly but certainly not least on Sunday Finnish symphonic metal favourites Nightwish have joined the line-up, along with the US metal arena filling comeback kings Disturbed. It’s not certain as to where exactly these two will sit on the line up at the moment but if Nightwish were to sub-headline for Iron Maiden that would arguably be the biggest show of their careers to date. 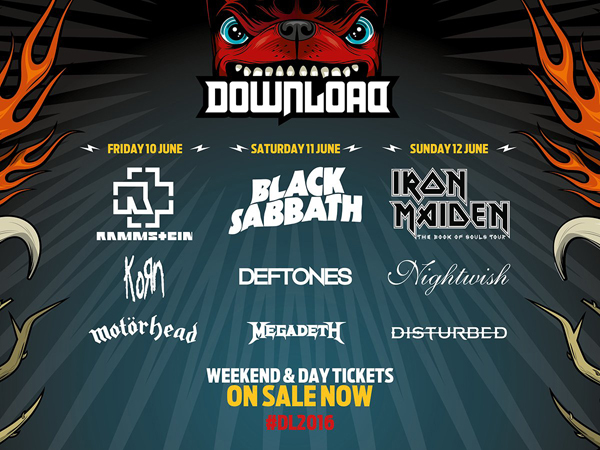 All six bands announced join Rammstein, Black Sabbath and Iron Maiden at the 2016 Download Festival taking place at Donington Park on the 10th – 12th of June 2016 (Campsite opens on the 8th). Tickets are available from the official festical website www.downloadfestival.co.uk. We reckon Mr Copping and the team will have at least one more announcement this side of Christmas so watch this space for more great bands joining these at next year’s Download.